Just a few hours' drive from Washington, D.C., in south-eastern Virginia, you’ll find one of America’s most loved beach destinations. Virginia Beach is not only the world’s longest pleasure beach, but also a charming coastal town that blends rich history, modern comforts and natural beauty. Here, the beach life keeps you entertained, offering a chance to explore the wonders of nature, enjoy outdoor activities and experience new things together. Stay in comfort with views of the ocean. Dine on fresh, delicious coastal fare. Find treasures of all kinds. Make our famous boardwalk your own path to happiness. Just like the first English-speaking settlers to arrive in North America, who landed on these shores, you’ll blaze new trails in Virginia Beach. 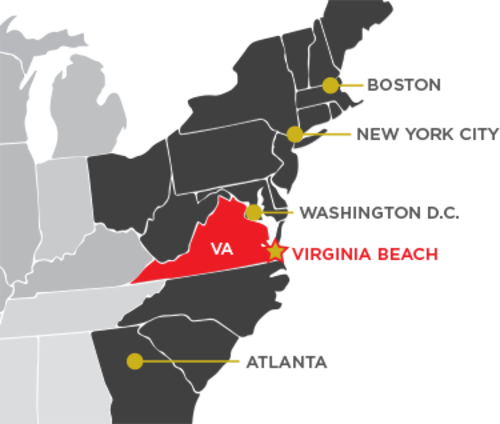 Centrally located on the U.S. East Coast, Virginia Beach is in the south-eastern corner of Virginia. The popular resort city is just three-and-a-half hours south of Washington, D.C. and within a short driving distance of many eastern, southern and central U.S. cities. Nearly one-third of the U.S. population can reach Virginia Beach in less than a day’s drive.